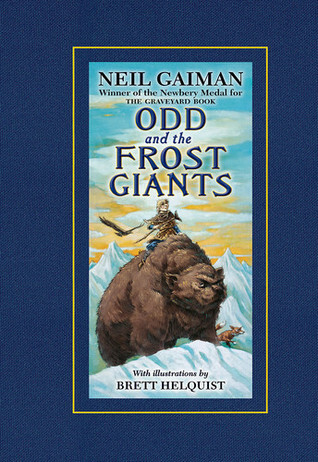 One of the middle grade books I consistently see positive reviews and recommendations for is Neil Gaiman’s Odd and the Frost Giants. I shouldn’t be surprised, as it is a book by Neil Gaiman. He’s the author version of a rock star. And I have liked all* of his books (though I love Neverwhere best). So now it’s Middle Grade March and I’m catching up on titles I’ve meant to read for a long while, and well, what do you know… I had a copy of Odd on my Kindle app. Odd is a Viking boy with a lame leg, a clever turn of mind, and a strong sense of self. When one of the harsh Norse winters threatens to continue unendingly, he leaves the safety of his village and sets off into the forest. While Odd isn’t necessarily looking for adventure, it comes and finds him anyway, in the shape of a fox, an eagle and a bear. Odd’s decision to travel with these three will change his future, and give him a place in legend. Odd and the Frost Giants was lovely and brief and true. At the same time, it didn’t skimp on the sorts of elements that boys and girls love: talking animals, epic adventure, riding bears and conquering giants! At the story’s core are themes of transformation, story-telling, and discovering the secret desires of our hearts. There’s also a strong dose of mythology and problem solving and several journeys toward home. What I found most intriguing was Gaiman’s use of the Norse gods as characters in the story. Gaiman has done this (weaving deities from many traditions into an original tale) before in his adult works, particularly in American Gods and Anansi Boys. While the gods’ inclusion works mostly to highlight Odd’s personal transformation, the hints at well-known story sagas and the mention of Thor’s hammer (which even the uninitiated will recognize from recent Avengers films) should spark interest in traditional tales and further reading in general. And that is a marvelous thing. Recommended for: young readers, fans of fantasy and mythology, and anyone looking for a quick read that will find its way into your heart. *I should mention that I didn’t make it through Coraline the first time I tried it – I was creeped-the-heck-out. Totally going back and reading it again soon! Loved this book so I'm glad you final read it. This is a favorite of mine! It's one of my go to gift books, because it's so very nice as a physical object as well. I'm so excited that there's going to be a sequel! This is such a great little book, right?! I love reading stories based on Norse legend and folklore, and so I was excited to read this one. It's both impressive and not at all surprising that Neil Gaiman can pack so much inventiveness and feeling into such a small package! This is actually my favorite of Gaiman's middle grade books--I'm a sucker for the Norse mythology infused in it. It's such a fun quick read! I own this one, but it's actually one of the few Gaiman books I haven't read yet. I'm glad to hear it was interesting. I'm looking forward to seeing how the Norse gods are used.